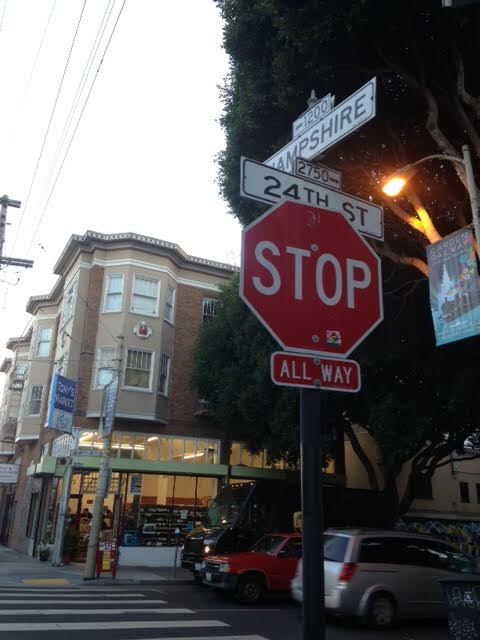 An hour before heading to the Red Poppy to hear a poetry/music slam, my friend Anita and I strolled along 24th street, seeking dinner. We were tentatively headed to the Roosevelt Tamale Parlor, but willing to be waylaid if we found something we liked sooner. 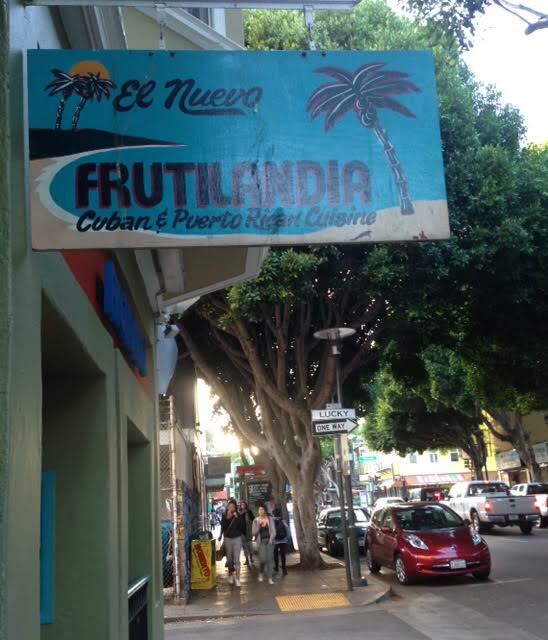 That waylaying place turned out to be El Nuevo Frutilandia. We glanced at the plate glass door, whose sign said it wouldn’t open for another five minutes, then glanced at the menu posted alongside. Suddenly a young woman opened the door. There was already a small but happy group at the bar along the back wall of the simple but brightly-colored restaurant. What the hell. We decided to go in. The lovely young woman introduced herself. Tyrisha. Turns out she is the co-owner and manager, along with her husband Rafael Frias. I asked Tyrisha about the first owner, whose name I can’t remember. She didn’t know him, she said. Personally I remember his face, his presence like it was yesterday. This is how “yesterday” was. Lincoln and I had returned from a year in Cuba in November, 1974. It seems like a minute ago. But, no, it was 41 years ago. We were in culture shock. Also basically broke. On our return we’d hoped to rent a one bedroom apartment somewhere in the city, but even then the prices were going up, year by year. Living in the Mission, where we could hear Spanish every day, felt culturally familiar, and, more like “home”. Unlike now, it was one of the least expensive neighborhoods in San Francisco. We found a studio apartment on the corner of 24th and Hampshire Streets for $150 a month. I got an LVN job on the night shift at St. Luke’s Hospital. Lincoln got hired to work downtown at George Lithograph. We filled our studio with a double mattress on a board and blocks, cinder block and wood plank bookcases, a tiny wooden table and two chairs, and colorful political posters of Vietnam and Cuba. Fortunately we were in love, and living in the Mission. Pretty much heaven. We bought sandwiches, sundaes and house-made candy at the St. Francis Fountain one block away. It seemed old-fashioned even then. I loved it. We got to know the family that had always owned it. We also ate at Roosevelt Tamale Parlor, La Victoria, and Guadalajara del Noche. In those days I don’t think there was one yuppie-style business on the entire stretch of 24th between Potrero and Mission. What I called the “heart of the Mission.” It was our sanctuary, long before San Francisco became an official sanctuary city for all kinds of refugees. Further up the street was a Cuban restaurant called Frutilandia. Occasionally we ate there too. Mostly I remember the owner, a tall, seriously overweight, dark-skinned Cuban man, who would sit out front every day, while his younger, slimmer wife did all the work inside. He enjoyed greeting people and being with his infant daughter, a roly-poly curly-headed little girl dressed up in the girly-est of frilly frocks and ribbons, the apple of her father’s eye. Sadly he died when his daughter was still a baby. At first I thought Tyrisha might be his daughter. She told me she is forty, so she could have been. That would have been the coolest thing in the world. Alas, she wasn’t. Still, the evening turned out to be a beautiful walk down memory lane, and a culinary delight. When I asked our lovely waiter Nick if the shrimp in garlic butter sauce was gluten free, he said he’d check. A minute later, the chef came out and happily, kindly explained every last ingredient I would find in the dish. Not a drop of gluten. I swear to God, it was the best shrimp in garlic butter sauce I’ve ever eaten. It was how shrimp in garlic butter sauce is supposed to taste! And the black beans and white rice, which came out separate, but which I mixed together Cuban-style to create Moros y Cristianos, were perfect. Anita had ceviche and sangria. We shared a beautiful salad that had the usual stuff, but also jicama and guava, and guava-cilantro vinaigrette. It was all kind of perfect. I’ve never really been one to be nostalgic for my past. It finally happened. This brings back memories for me too. I remember riding into SF on our bikes when you lived in the Mission. I loved visiting you there and walking around what to me seemed like another country. I loved the panaderia and the colorful stores. I loved your apartment full of colorful posters and political statements. This brings back memories for me too. 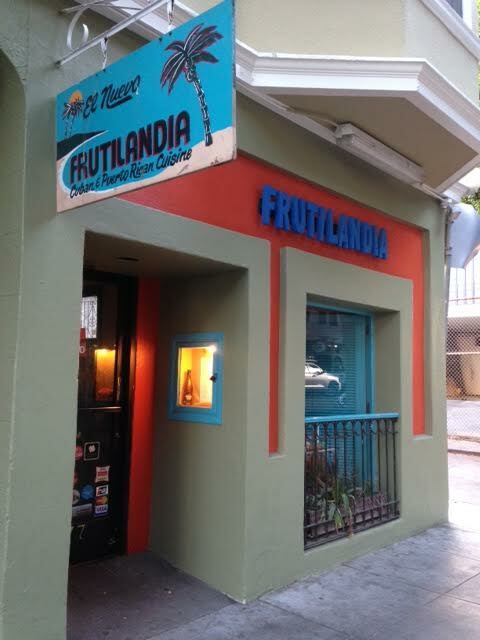 Love these memories and there’s a NEW Fruitlandia! Next visit lets go here! !